I grill multiple foods (including vegan patties) on pie tins on my grill! I do this so veggies don't stick or fall through the slats into the fire. I can make a few different foods at one time, for parties or just multiple meals for the week. Sauces won't mix together. I can use a potholder and remove one tin of food that might finish quicker (zucchini for instance) and add another food to the grill. I can even keep the removed tin in an oven if I really want to keep it warm. It's easy and portable. 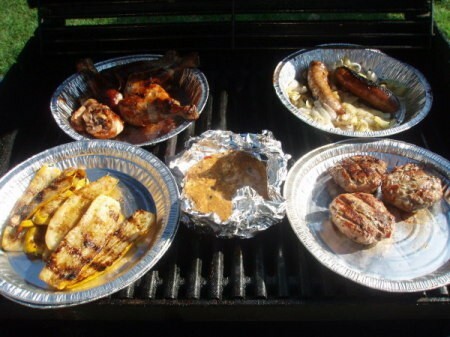 You can reuse your tins and not waste aluminum foil, which always seem to rip anyway.